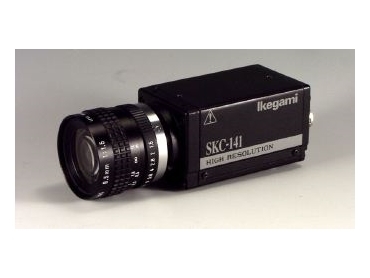 THE Ikegami SKC-141TC is a frame-shutter monochrome camera that can output all picture elements at 1/15 second (H:V 1392 x 1040) using 2/3" square pixel CCD. Available from Mastatek , the camera is particularly sensitive to infrared allowing use in special day/night applications. Square pixels eliminate the need for image correction algorithms in image detection systems. Random shutter mode allows the camera to capture the high-resolution frame under the control of external equipment such as a contact closure or proximity detector. When operating in random shutter mode with no input trigger pulse, the shutter mode becomes automatic and outputs the full 15 frames per second. In continuous shutter mode the full 15 FPS image is output. The camera interfaces to an auto iris lens thus lowering the system cost for day/night operation. Furthermore an RS232C function allows remote control commutation. Features of this camera include adoption of square pixel CCD, frame shutter function, random trigger function, sync reset function, adoption of high sensitivity CCD sensor, automatic switching of internal synchronisation/external synchronisation, flange focal length adjustment mechanism, durable design, compact and light weight and RS232C is available for remote control use. Applications include robotics, machine control, remote surveillance, vehicle detection and alphanumeric decoding.